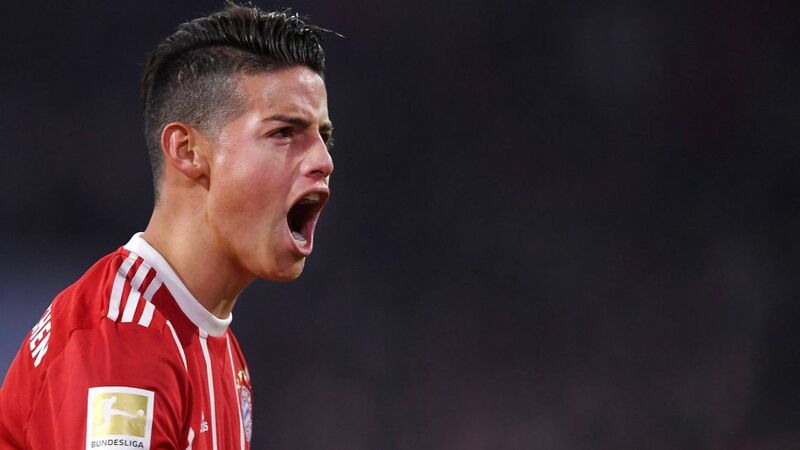 Bundesliga | Bayern Munich's James Rodriguez: "We've got big plans for the rest of the season"
Bayern Munich's James Rodriguez: "We've got big plans for the rest of the season"
James Rodriguez acknowledged his increased playing time and the influence of Jupp Heynckes have helped him perform to his best with Bayern Munich as he targets silverware with the Bavarians in 2018. The Colombia international joined Bayern from Real Madrid last summer, and after a slow start has quickly built up a head of steam with the Bundesliga's record champions. After having a hand in two of Bayern's goals in their 3-1 UEFA Champions League defeat of Paris Saint-Germain on Tuesday, he revealed the reasons for his — and his club's — upswing in fortunes as they prepare to continue the fight on three fronts in the new year. Question: James, how much of a confidence booster was the 3-1 win over PSG? James: It's done a lot of good. The win gave us a great deal of self-confidence for our upcoming games. Hopefully we still have a lot to play, because we've got big plans for the rest of the season. We've shown that we needn't fear a great team like PSG. It was a fair result. Question: You were involved in two of Bayern's goals with two outstanding crosses. Are you happy with that? James: I'm very happy. I feel great here at the moment and you can see that reflected out on the pitch. Most of the things I try to do work out. Obviously that has a lot to do with the fact that I've played a lot recently. I just want to play my part in helping Bayern win. Question: Jupp Heynckes trusts you. Can you feel his faith in you? James: Definitely. It's like I've always said: talent and form are one thing, but having continuity playing out on the pitch is just as important. On top of that, the fantastic players at Bayern make your life a lot easier. I'm happy. Watch: James, Müller or Thiago? Who is Bayern's best No.10? Question: Eight weeks after losing 3-0 in Paris you got revenge in Munich. How do you explain such a radical turnaround? James: We started on a very good run several weeks ago, and that gave us confidence. We know what we're capable of doing and didn't let ourselves get rattled. It's normal to go through ups and downs in any given season, but it's important to keep at it and not to lose faith. You could see what we're capable of against PSG. We're playing well, becoming increasingly solid and are a good team unit. Now we just have to keep going. Question: How much of an impact has Heynckes had? He has praised your ability a few times in press conferences and has said that you need a coach who can speak Spanish with you. Is he right? James: You're certainly grateful when your coach can speak to you in your native language. It makes everything so much easier, whether it's tactics or even just everyday things that you didn't understand but that he then explains to you. Question: The UEFA Champions League round of 16 draw takes place on Monday. Are you relieved Bayern can't face your former club Real Madrid, who also finished as group runners up? James: There are no easy opponents in the Champions League last 16. We'll have to be at our best both home and away, regardless of who we play against. We can't afford to get complacent. These are the games that can make your season. Question: How about meeting Real in the quarter-finals? James: [Laughs] Obviously that'd be nice. We'll just have to see what happens.